Teach young men and women the skills required for basic vessel systems, running compass courses underway, Basic Navigational Chart Reading and Aids to Navigation and Emergency Procedures while underway. 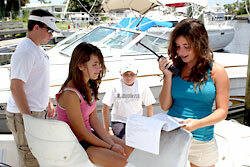 Review Safe Boating requirements and their importance. Learn emergency procdures while underway. Minimum class size is 5 and the maximum is 12 students. Review and build on the skills learned in the Basic Program. Review and practice of vessel procedures prior to getting underway. Basic navigational chart reading and aids to navigation while underway. (man overboard, fire at sea). Inland navigation run to refine boat handling and navigational skills. Persons attending the 4 day program must be between ages 11 and 13 and in good health. Basic math skills and completion of our Basic Course or holder of a Safe Boating Course Card from another institution or state. Each student is required to furnish his/her own deck shoes. A Chapman School certificate of completion is awarded to students who complete the course. Upon completion of Summer Boating For Youth, you may wish to continue your boating education with Advanced Summer Boating For Youth, Voyager or Power Boat Handling (Age limits apply - See course brochure for details).